The baby shower gave me my first opportunity to make tapenade, and I thought it was delish. 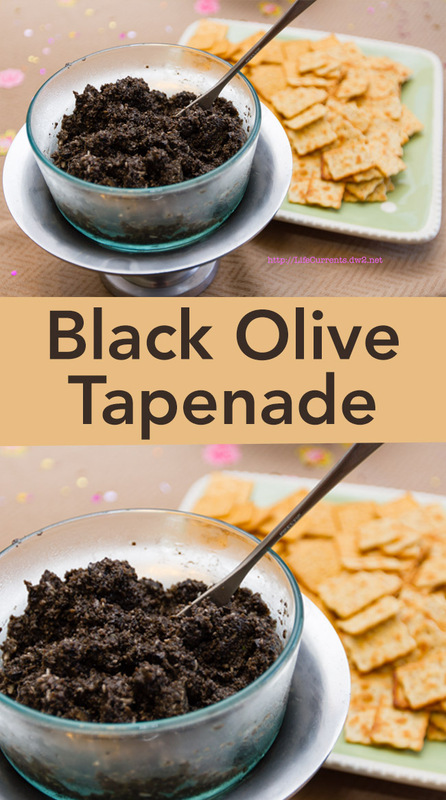 The mommy-to-be loves black olives , so I thought this would be a fun and different appetizer for the party. Everyone, including Maria, said they loved it too! Puree garlic and basil in a food processor. Add olives, oil, and cheese, and pulse to a smooth, thick paste. Serve with crackers or bread for spreading. Made a nice big amount, perfect for sharing. Great receipe but need to edit it by showing how much it makes. Leslie, I’ve made this a couple of times, but because I serve it as a spread at a party it’s really hard to say how many people it serves. Some people take a lot, some people take a little. It make a nice serving for a party.